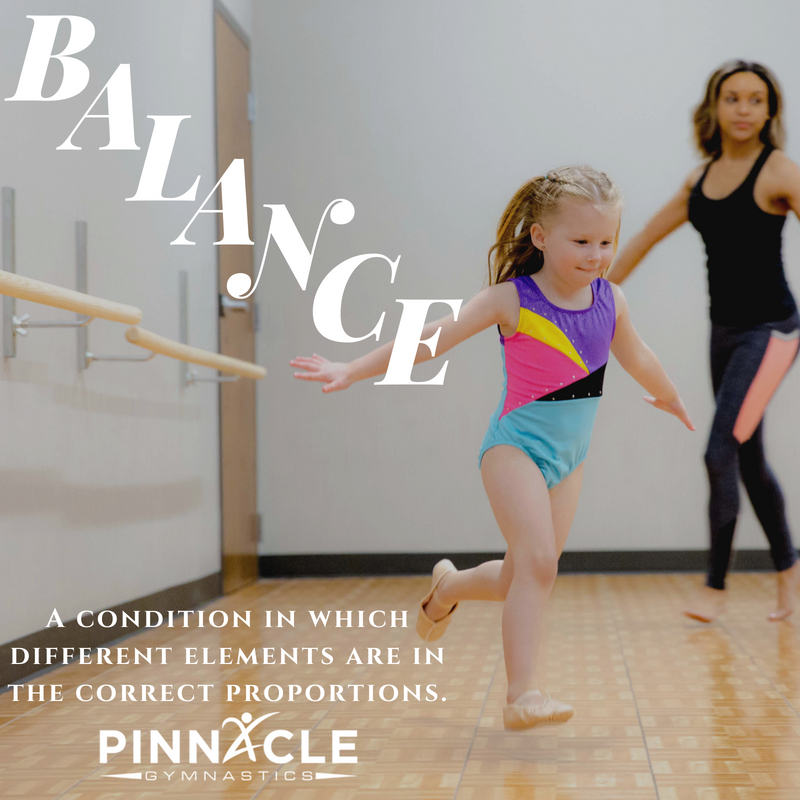 Balance has multiple meanings, especially with in the sport of gymnastics. However when you look at this definition, you can apply it to both sport and normal every day life. 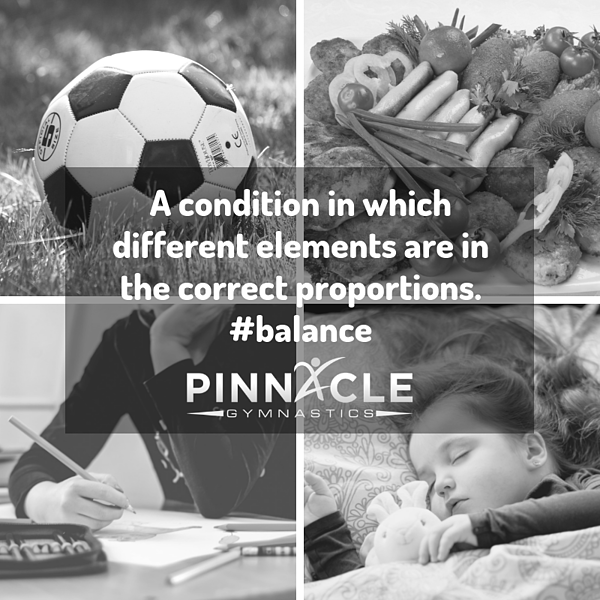 Balance is a condition in which different elements are in the correct proportions. The top pillars of character include balance - not just in a physical sense, but within your family life as well. Why is Teaching Kids about Balance Important? I don’t know about you, that my kids love nearly everything. When I make a new dinner that they like, the next question is can we have this every week? When they attend the first night of sports practice they immediately want to know when they get to do it again. The same is true for indulging in screen time, playing with friends, binging on ice cream, and other things that not just kids love to splurge on. However, as the old adage tells us balance is extremely important in maintaining a healthy physical, mental, and emotional level of stability. 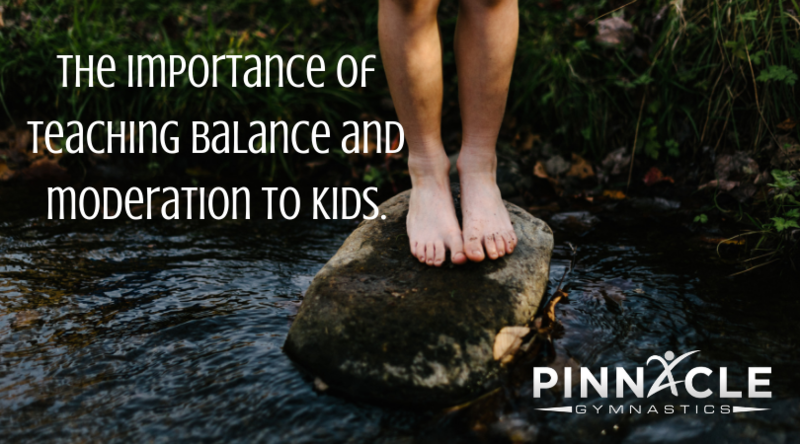 We can address balance with our children in a number of ways. Using phrases like “in moderation” and “only take what you need” canhelp us reinforce the importance of balance in every day life. Teaching children about balance in every day life will take some reflection on your family‘s schedule. When we talk about balance we are talking about the amount of time and energy spent at school at home, at sports, at play, and at rest. Each one of these pillars of balance must work with the others to keep a child, and likely a family, happy and productive. Just as there is such a thing as too much, there is also such a thing as too little. For each individual, the amount of hours spent on each of these pillars will vary. That is what makes us individuals after all. Many parents will observe that age, gender, and personality have a huge role in determining what the right amount of activity is for their child. Spoiler alert: there is no magic formula. It will take trial and error. Children can only remain happy and be as active as the amount of rest that they receive and with that dress comes the importance of nutrition. Nutrition is not just food intake, but the quality, quantity, and timing of that intake. In addition to food intake, water is an extremely important part of nutrition, especially for kids. When you are considering your children’s weekly schedule, you need to teach them about the importance of sleep, downtime, and proper nutrition. When children understand the importance of balance throughout their lives and how that affects their ability to do well in school, be happy at home, and perform well on the playing field, it is easier for parents. Sports are a privilege. They can be a huge negotiating factor for parents. Getting children to eat a balanced meal is easier when they truly believe that the food they are eating will improve their ability to play sports. How Can Children Play Multiple Sports and Maintain Balance? Some might argue that limiting hours of activity causes kids to specialize at too young of an age. Others ignore the advice and over schedule their children causing burn out and behavioral issues. Another person might feel that this amount of activity is too much for a child of that age. Trial and error are an important part of solving the puzzle. Let’s consider another option. This option includes recreational sports, lessons in the arts or faith, and seasonality. Recreational sports are a wonderful option for preschool and elementary aged children. Recreational sports introduce children to other children providing socialization as well , As well as to adults mimicking the relationship a child will have with the teacher including following directions. The other beauty of recreational sports is there is a minimal time commitment. Many recreational classes, including gymnastics classes for kids, meet once a week for 50-60 minutes. There are no competitions. Recreational soccer teams practice once a week and likely have one game per weekend. The same is true for many other recreational sports. Piano lessons are around 30 minutes each week. With the recital only 1 to 2 times per year. If your child is not interested in athletics or music you can likely find an art class or participate in activities at your school or place of warship to provide social interaction outside of the home and classroom. As children get older, their likes and dislikes strengthen. They will be able to vocalize where they would prefer to spend their time. Listening to them is just one of the many ways to empower kids. Also, as children get older their talents are more recognizable and it might be easier to agree to specialization. According to USA Today, Kids should play multiple sports and not focus on just one. For kids that hate to choose, don’t make them. Instead, use their passion to teach them how important it is to create balance in their lives. From teaching proper nutrition and discussing sleep requirements at a young age, you are setting your children up for a lifetime of success. Best of luck to you and your family as you search for the perfect balance between sports, school, home, and all of the other wondrous areas that make up your lives.